BACKGROUND: The successful application of the information systems in the health-care domain requires a reasonable recognition of the factors affecting the acceptance and use of such systems. The study aimed to investigate the factors affecting the acceptance and use of an integrated health system (IHS) in Isfahan primary health centers. MATERIALS AND METHODS: It was an applied and descriptive–analytical survey conducted in Isfahan, Iran. Research population included all IHS's users in the health centers no. 1 and 2 of Isfahan city from which a sample of 320 individuals were selected in total. Data were collected using a questionnaire developed based on the Unified Theory of Acceptance and Use of Technology model. Data were analyzed using partial least squares (PLS) method and SmartPLS software. RESULTS: The users' behavioral intention to use the IHS system was influenced by performance expectancy, effort expectancy, and social influence, but it was not significantly related to facilitating conditions. Behavioral intention to use the IHS also had a significant relationship with the use of system. Furthermore, performance expectancy was the most important predictor. CONCLUSIONS: According to the findings, if the system users perceive the positive role of system in performance improvement, its convenience to use, and positive attitude of others toward it, their willingness to accept and use system will increase. Furthermore, it was important for the users that the system helps them in resolving their daily work-related problems and making rational decisions. Along with the rapid progress of the health information system technologies during the recent years, implementing and using various versions of these technologies has increased in the medical health-care organizations and centers. As the most significant and complex information technology in the health domain, the electronic health record system (EHRS) has allowed better servicing to the patients in the primary health centers, hospitals, and other health-care centers. The latest project implemented in Iran in the field of EHRS is integrated health system (IHS) entitled “SIB” launched from 2015 in all the medical universities throughout the country in line with implementing the Health Sector Reform Plan. As the most significant plan in the health-care section, it was implemented in 2016 in all the primary health-care centers throughout Iran. This web-based system in use in the primary health-care centers has been specifically designed for collecting and processing the health-related information of various age groups previously recorded in the paper forms and maintained in the health center's family record. Due to the complexity of the health-care environment, the implementation of EHRS is not always successful. It is estimated that these systems either are abandoned in about 40%–70% of the cases or fail somehow., Since the failure of EHRS may bring in some negative effects on services and care provision incurring huge costs to the health system, it is necessary to take the necessary measures to avoid the system failures. Lack of acceptance and use of the information systems by the users or their resistance toward the adoption of new systems have been identified as the most significant reasons for the failure of information systems.,,,, As a result, paying due attention to the factors affecting the acceptance and use of EHRS by the users is of particular significance., Till now, numerous studies have tried to explore the factors affecting the acceptance and use of the information technologies using various models and theories. The Unified Theory of Acceptance and Use of Technology (UTAUT) is one of the newest and most efficient theories introduced by Venkatesh et al. in 2003 obtained from the integration of eight different models and theories on the technology acceptance. It has been applied in different areas including health care. UTAUT's variables include performance expectancy, effort expectancy, and social influence and facilitating conditions determining the behavioral intention to use the technologies. Performance expectancy refers to what extent one person perceives the usability of one technology such as information system promoting his/her performance and assisting him/her in obtaining the desirable professional interests. By definition, effort expectancy refers to the degree of perceived ease when using a system while the social influence is defined as one person's belief regarding the effect of important users' perception of the system determining using or not using a technology. Finally, facilitating conditions can be defined as to what degree one person believes that the organizational and technical infrastructures required for supporting the system use are available. In this study, besides the UTAUT model's variables, the variable of system use has been studied from two aspects of problem solution and rational decision-making based on Doll and Torkzadeh's study. It is hoped that this study makes the managers and policy makers in the field of health information systems aware of the importance of paying attention to the factors influencing the acceptance and use of the information systems by the users in the health-care organizations and centers. Furthermore, since the IHS is in its early stages of evolution, this study tried to present some strategies for motivating the users to accept and use this system. This study was conducted using an applied and analytical survey research method. Research population consisted of IHS's users in the health centers no. 1 and 2 in Isfahan city covering 1484 and 1261 individuals, respectively. Using Krejcie and Morgan Table, the sample size was found to be 320 individuals. In the next step, proportionate stratified random sampling method was used and a sample of 140 and 180 respondents were selected from health centers no. 1 and no. 2, respectively. 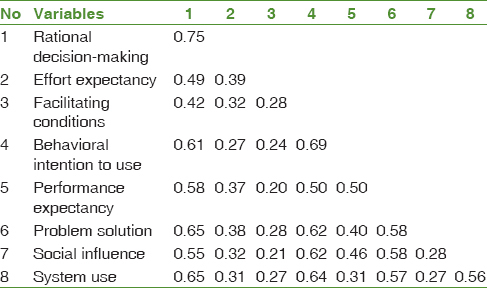 The questionnaire used for evaluating the variables was adopted from the articles published in the reputed international journals [Table 1]. 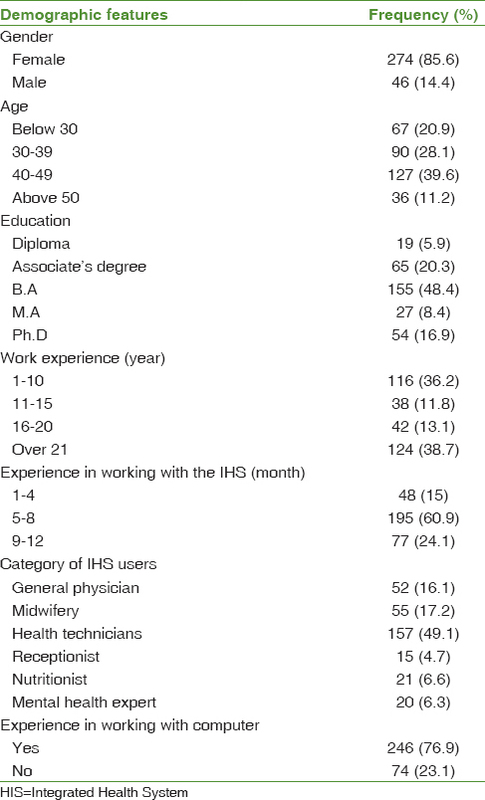 It was designed based on two separate sections: the first section included seven items covering the demographic information of the research population including the age, gender, education, job experience, experience associated with using IHS, the category of the IHS users, and experience in working with the system. The second section was devoted to the items regarding different variables of the research model categorized in the following way: 7 items for the performance expectancy, 6 items for the effort expectancy, 6 items for the social influence, 11 items for the facilitating conditions, 6 items for the behavioral intention to use, and 15 items for the system use (9 items for problem solution and 6 items for rational decision-making). The second section of the questionnaire was formatted into 5-point Likert scale. The content validity of the questionnaire was confirmed by pooling the ideas of five academic members of the health information management and two information technology experts from the Isfahan province's Health Deputy. 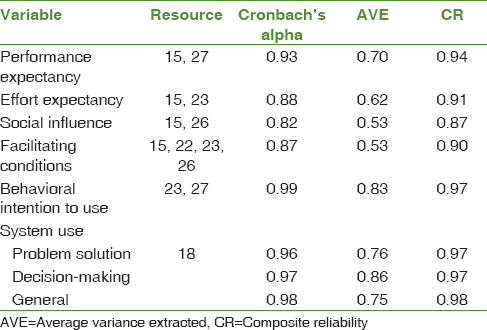 The construct validity was assessed using confirmatory factor analysis while its reliability was estimated using Cronbach's alpha. To assess the construct validity, three measures of composite reliability, the average variance extracted, and factor loading were used. The composite reliability and average variance extracted exceeded the minimum required values [Table 1] while the factor loadings obtained for all the items related to the facilitating conditions were found to be over 0.6, except items no. 1, 2, and 10. These items were below 0.6; hence, they were omitted from the model. The Fornell–Larcker index was satisfied in this study. Hence, the convergent and divergent validity were confirmed implying the acceptable construct validity of the questionnaire [Table 2]. To test the hypotheses, the partial least squares method and SmartPLS 2.0 M3 software (2005, Version for windows, Hamburg: SmartPls, http://www.smartpls.de) were used. The findings of the study on the demographic section revealed that 85.6% of the IHS's users were female while 14.4% were male. The age range of 40–49 (39.6%) years and over 50 years old (11.2%) were the highest and lowest age range of the participants under study, respectively. The B.A. degree (48.4%) and a job experience over 21 years (38.7%) had the highest frequency while diploma (5.9%) and a job experience of 11–15 years (11.8%) had the lowest frequency. The majority of the IHS's users were the health technician (49.1%) while the lowest were the receptionists (4.7%). The highest and lowest work experience with the system was found to be 5–8 months (60.9%) and 1–4 months (15%), respectively. In total, 76.9% of the IHS's users had the experience of working with computer [Table 3]. The test results of the hypotheses indicated that all the hypotheses except the relationship between the facilitating conditions and behavioral intention to use were statistically significant at significance level of 0.001. Hence, the relationship between the facilitating conditions and willingness to use the system was not significant. As a result, this hypothesis was rejected [Table 4]. Among the various factors including the organizational, technical, and human factors influencing the success or failure of the health information systems, the human factors – the acceptance and use of the system by the health-care providers, in particular – play a key role in the success of these systems in the typical and complex health-care environment. Accordingly, it must be given special attention by the policy makers in the health information technology field. Given the significance of the subject of the study, this research tried to explore the factors affecting the acceptance and usage of the IHS from the users' perspective using the UTAUT model. As per the obtained results, the behavioral intention to use the IHS system is influenced by three variables including the performance expectancy, effort expectancy, and social influence with the performance expectancy recognized as the most important predictor of the users' behavioral intention to use the IHS system. A statistically significant relationship was observed between the effort expectancy and behavioral intention to use the IHS. The results reported by Sharifian et al., Kijsanayotin et al., Phichitchaisopa and Naenna (2013), and Ifinedo,,, conformed to the results of this study. The IHS users believed that the behavioral intention to use the system will increase where working with the system is easier and the system has a higher level of conformity with their work practices. As per the obtained results, there was a statistically significant relationship between the social influence and behavioral intention to use. This result conformed to the results obtained in the studies of Jahanbakhsh and Nazemi, Sharifian et al., Kijsanayotin et al., and Holtz and Krein.,,, The positive perception of the important individuals can serve as an effective motivating factor for the care providers such as colleagues increasing their intention to accept and use the system. As Venkatesh et al. argued, when using the system is compulsory for the users, the social influence would play an important role in increasing their willingness to use these systems. The IHS users have the same idea. Opposed to other variables, the facilitating conditions did not have a statistically significant relationship with the behavioral intention to use the IHS. 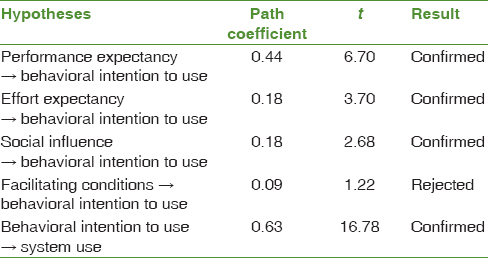 The results are in line with the results reported in the studies of Love, Zuiderwijk et al., and Hoque and Sorwar.,, The level of significance of the facilitating conditions varies for different information systems. Numerous studies have shown that given the involvement of more significant factors such as performance expectancy, effort expectancy, and social influence, the facilitating conditions cannot be regarded as a good predictor for the behavioral intention to use. Some users in this study believed that taking some effective measures such as increasing the technical and organizational support, continuous upgrading of the software and resolving the software-related problems, holding educational courses, providing access to the system operation manual, and increasing the internet speed will result in an increase in the willingness to use the system. Despite such belief, most of the participants in the study regarded the other factors incorporated into the model (performance expectancy, effort expectancy, and social influence) more important in increasing their willingness to use the IHS system. As for this study, the behavioral intention to use was significantly related to using the system for problem resolving and rational decision-making. There is also some evidence implying that the behavioral intention to use acts as a strong predictor of the technology use.,,, However, in these studies, the variable of system use has been examined in general ignoring its possible varied reasons. Although Kijsanayotin et al. in their research explored different dimensions of using the system such as use frequency, care and reporting, administration, and communications, they did not take into account some other main dimensions such as problem solution and decision-making. These two variables were touched upon in this study. Information system allows the problem solution and rational decision-making. The system will allow analyzing the underlying reasons of the problems and finding efficient solutions for them. To put it differently, the system enables the personnel to present obvious and rational explanations based on the available evidence. This in turn will facilitate their decision-making to overcome their daily problems. The more the system enhances the functionality of the personnel in these domains, the more the personnel will have motivation to use the system. As a result, system use is a complex concept which must be approached multidimensionally. As per the findings of this study, the users expected that IHS system assists them in finding the best problem solution approach, analyzing the different medical health-care situations and gaining a better understanding of the health events and making more rational decisions. Accelerating the decision-making processes, justifying the underlying reasons of the decisions, and improving the effectiveness of the decisions and the management and control of the job functions were among the other expectations. As per the users' perspective, this system had succeeded to satisfy such expectations to a very low degree making their more serious consideration a necessity. According to the results of this study, the positive perception of the IHS users of the role of the system in the performance improvement and the perceive convenience of working with the system will increase their behavioral intention to use. In addition, when their colleagues and peers, who influence their decisions, show a positive attitude toward the system, the user intention to accept and use the system will accordingly increase. The significant relationship observed between the behavioral intention and using IHS for the problem solution and rational decision-making purposes implies the criticality of the system capability in resolving the daily work problems and making correct, rational, and timely decisions for the users. In fact, such features will motivate the users to use it more efficiently. It seems that a large number of health information system projects in Iran are being implemented without giving due consideration to these factors leading to system failure. Hence, to increase their success rate, these factors must be taken into account by the respective authorities involved in the design and implementation process of systems in the Health Ministry as well as the Health Deputy Office. This paper was a result of a M.A. thesis in Health Information Technology with the code 396295 conducted with the financial support of the Research and Technology Deputy of Medical Management and Informatics at Isfahan University of Medical Sciences. The authors would like to express their deep and sincere gratitude to all the users of IHS in the health centers no. 1 and 2 in Isfahan City who assisted us in conducting this research. This paper was financially sponsored by the Research and Technology Deputy of Medical Management and Informatics in Isfahan University of Medical Sciences. McGeorge NM, Hegde S, Guarrera TK, Zhou Y, Lin L, Crane PW, et al. Studying the impact of interoperable electronic health records on workflow in ambulatory care. Int J Ind Ergon 2015;49:144-55. Raymond L, Paré G, Marchand M. Extended use of electronic health records by primary care physicians: Does the electronic health record artefact matter? Health Informatics Journal 2017;00:1-12. News and Information Center of the Ministry of Health and Medical Education. Integrated Health System (SIB) as Important Plan of Primary Healthcare in 2016; 2016. Available from: http://www.behdasht.gov.ir/?siteid=1&pageid=1508&newsview=142544. [Last accessed on 2017 Jul 13]. Importance of Electronic Health Record: Discussion with Dr. Nasser Kalantari, Consultant of Deputy of Minister of Health. Behvars 2016;2: 5-13. Regan EA, Wang J. Realizing the value of EHR systems: Critical success factors. Trans Int Conf Health Inf Technol Adv 2015;3: 20-36. Kaplan B, Harris-Salamone KD. Health IT success and failure: Recommendations from literature and an AMIA workshop. J Am Med Inform Assoc 2009;16:291-9. Sharifian R, Askarian F, Nematolahi M, Farhadi P. Factors influencing nurses' acceptance of hospital information systems in Iran: Application of the Unified Theory of Acceptance and Use of Technology. Health Inf Manag 2014;43:23-8. Cannon MD, Edmondson AC. Confronting failure: Antecedents and consequences of shared beliefs about failure in organizational work groups. J Organ Behav 2001;22:161-77. Bajwa NK, Singh H, De KK. Critical success factors in electronic health records (EHR) implementation: An exploratory study in North India. Int J Healthc Inf Syst Inform 2017;12:1-17. Shahbahrami A, Moayed Rezaie S, Hafezi M. Effective factors in acceptance of electronic health record from employees point of view. J Guilan Univ Med Sci 2016;24:50-60. Maghsoudloo M, Abolhassani F, Lotfibakhshaiesh N. Connecting primary health care: A comprehensive pilot study. Acta Med Iran 2016;54:441-7. Gagnon MP, Ghandour el K, Talla PK, Simonyan D, Godin G, Labrecque M, et al. Electronic health record acceptance by physicians: Testing an integrated theoretical model. J Biomed Inform 2014;48:17-27. Joos D, Chen Q, Jirjis J, Johnson KB. An electronic medical record in primary care: Impact on satisfaction, work efficiency and clinic processes. AMIA Annu Symp Proc 2006:394-8. Venkatesh V, Sykes TA, Zhang X, editors. 'Just What the Doctor Ordered': A Revised UTAUT for EMR System Adoption and Use by Doctors. System Sciences (HICSS), 2011 44th Hawaii International Conference on; 2011: IEEE; 2011. Ifinedo P, editor. Technology Acceptance by Health Professionals in Canada: An Analysis with a Modified UTAUT Model. System Science (HICSS), 2012 45th Hawaii International Conference on; 2012: IEEE; 2012. Turan A, Tunç AÖ, Zehir C. A theoretical model proposal: Personal innovativeness and user involvement as antecedents of Unified Theory of Acceptance and Use of Technology. Procedia Soc Behav Sci 2015;210:43-51. Doll WJ, Torkzadeh G. Developing a multidimensional measure of system-use in an organizational context. Inf Manage 1998;33:171-85. Nikabadi M, Naghipour N. A model for assessing hospital information systems. J Health Adm 2015;18:50-66. Scholl J, Syed-Abdul S, Ahmed LA. A case study of an EMR system at a large hospital in India: Challenges and strategies for successful adoption. J Biomed Inform 2011;44:958-67. Hoque R, Sorwar G. Understanding factors influencing the adoption of mHealth by the elderly: An extension of the UTAUT model. Int J Med Inform 2017;101:75-84. Kijsanayotin B, Pannarunothai S, Speedie SM. Factors influencing health information technology adoption in Thailand's community health centers: Applying the UTAUT model. Int J Med Inform 2009;78:404-16. Jahanbakhsh M, Nazemi Z. The Study of Factors Affecting Adoption and Use of Picture Archiving and Communication System at Ayatollah Kashani Hospital Using Unified Theory of Acceptance and Use of Technology (Research Project). Isfahan, Iran: Faculty of Management and Medical Information, Isfahan University of Medical Sciences; 2015. Goudarzvand Ghegini M, Esmaeili S. The study of organizational culture associated with Unified Theory of Acceptance and Use of Technology model in hospitals of rasht. J Payavard Salamat 2015;9:29-42. Holtz B, Krein S. Understanding nurse perceptions of a newly implemented electronic medical record system. J Technol Hum Serv 2011;29:247-62. Phichitchaisopa N, Naenna T. Factors affecting the adoption of healthcare information technology. EXCLI J 2013;12:413-36. Zuiderwijk A, Janssen M, Dwivedi YK. Acceptance and use predictors of open data technologies: Drawing upon the Unified Theory of Acceptance and Use of Technology. Gov Inf Q 2015;32:429-40. Love VD. Improving Electronic Health Record Adoption among Rural Health-Care Workers: A Correlational Study: Capella University; 2015.